As you’d expect from Microsoft, Outlook tries to be as powerful as a desktop app. Considering it’s Outlook, what’s surprising is that it does so without compromising usability. It accomplishes this partially because it’s just a rebranded and updated version of the already fantastic Acompli. Even with all its features, Outlook has a clean design that only takes a few minutes to familiarize yourself with. Outlook divides your email into two main sections: Focused and Other. Focused is similar to something like Gmail’s Priority Inbox, where Outlook learns what emails matter to you and pushes those to the top. Everything else lands in the Other tab. You can also quickly filter your emails by flagged or unread, so it’s easy to find what you’re looking for. If triaging email is your thing, you can delete, archive, and snooze emails for later using a swipe gesture. Outlook’s other main focus is hooking into other services. You can add attachments from a variety of different cloud services and view your calendar without ever leaving the app. You can also use that calendar to set up meeting times and share them via email. As far as notification are concerned, you can set up notifications for calendar events alongside new emails on a per account basis. If that’s too much for you, you can also set notifications for only important emails that land in the Focused tab. Outlook’s not perfect. The Focused inbox works incredibly well, but it does take a little time before it works as well as Priority Inbox. Until then, you’ll have to manage your email (and notifications) to get it working properly, and even then there’s no manual override to ensure you always get notifications from a single person. The calendar, while handy, requires that your calendar is linked to your email, so if you’re just using the iOS calendar option and iCloud it won’t show up in Outlook. The same goes for your contacts. There’s also not much in the way of customization beyond changing the swipe gestures. Outlook certainly isn’t the only email app worth paying attention to. Apple Mail, the built-in option, is a solid choice for most users. The VIP email list makes it easy to keep your notifications from overwhelming you and its deep integration with iOS means it’s the most accessible email app for the platform. Newcomer Spark (Free) is easily the biggest competition for Outlook and will likely overtake it as the best email app for iOS once it’s updated. Once the app works out some kinks and is feature-complete it’ll be an excellent email app. Spark features an intelligent search engine, integrates with big cloud services, has a clever smart notification system, and is customizable in all kinds of ways. Spark’s still in its infancy, so it’s a little buggy and crashes for some users. It also has a number of features that are promised soon in updates, so once those come along it’ll be a lot more powerful. If you’re a Gmail user, you have three excellent options as well. Mailbox (Free), Inbox by Gmail (Free), and Gmail (Free) all have their own strengths and weaknesses. Mailbox is mostly about organizing email with swipes and other gestures, but it’s not great for anything else. Inbox by Gmail and Spark are incredibly similar, with the caveat that Inbox is Gmail only. Its organization system is much like Spark’s, but has a few more options and a variety of Google tricks, including creating to-do lists, setting up reminders, and bundling emails together. If you’re a big Gmail user, it’s a solid option. If Inbox is too nontraditional for you, the Gmail app looks a lot like the web app and does a great job of organizing email. 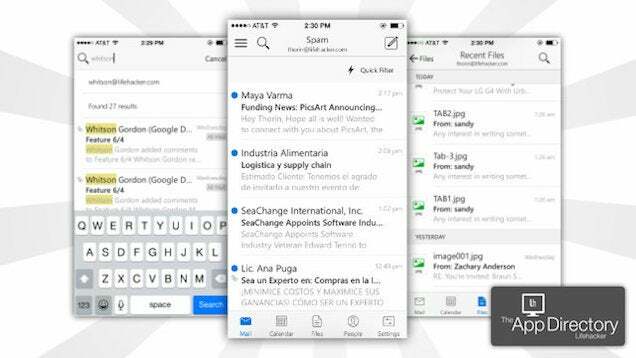 You can easily switch between accounts, organize and archive emails with a swipe, and more. For power users with multiple email account types, Dispatch ($4.99) is all about processing emails and automating as much as possible. You can easily respond to emails with text expansion snippets and quick replies. Beyond that, Dispatch connects to a ton of other services so you can organize your emails into 31 different apps, including Evernote, pocket, Reminders, and more. Beyond those, a couple other email apps are worth mentioning, including Boxer ($4.99), which stresses quick replies, and CloudMagic (Free) which hooks into other apps so you can organize your email using those instead of CloudMagic itself.